(01.06.17) The second and final funding period of the International Research Training Group ‘Zwischen Räumen – Entre Espacios’ (‘Between Spaces’) ends in around a year’s time, and the initiative has already produced some impressive results. The project, funded since 2009 by the DFG and its Mexican partner organisation CONACYT, was the focus of a symposium held at the Colegio de Mexico (COLMEX) in the Mexican capital. 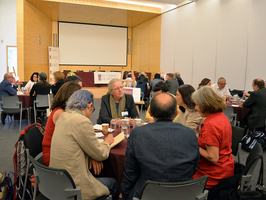 During the symposium, the speakers summed up the group’s activities over the past eight years. Special emphasis was given to the good career opportunities and openings available to the trained doctoral researchers. “It is clear to see that the group has produced some highly qualified and internationally competitive early career researchers,” said Dr. Julia Tagüeña, head of the department of scientific development at CONACYT. An equally important and positive outcome of the first International Research Training Group with a Latin American country is the intensification and expansion of scientific collaboration between Germany and Mexico. “‘Between Spaces’ has given rise to a relationship in the social sciences which is essential to the future of both countries,” said Dr. Arturo Borja, head of the department of international cooperation at CONACYT. As recognition of the support shown for the bilateral cooperation, CONACYT presented Dr. Stefan Rinke, a professor at the Free University of Berlin (FU Berlin) and coordinator of the group on the German side, with the Premio de Investigación José Antonio Alzate. The International Research Training Group is based at the Colegio de Mexico (COLMEX) and FU Berlin and is led by 20 established researchers in the humanities and social sciences, representing the fields of history, anthropology, politics, literature, economics and culture. The project incorporates a training programme for doctoral researchers at both institutions, the central theme being the investigation of the diversity of transnational, transregional and translocal levels inherent in the transnational perspective and the interactions and movements in the intermediate spaces. Prof. Dr. Marianne Braig, the representative of FU Berlin at the event, indicated that by the end of the project in 2018, ‘Between Spaces’ would have produced 63 German and 59 Mexican doctorates in a nine-year period. Prof. Dr. Carlos Alba, the group’s coordinator on the Mexican side, explained that the programme arose from a long-standing collaboration between the two institutions. His colleague Prof. Dr. Jean Prud’homme added that the group’s interdisciplinary approach set it apart from the general trend towards distinct specialisation. A delegation of rectors and university representatives from the state of Hessen, which happened to be in Mexico when the symposium was being held, took advantage of the chance to participate. Following the presentations, the participants gathered at different topic ‘tables’, which facilitated discussion between those interested in bilateral research cooperation. In parallel to this, a meeting was held with the President and the Secretary General of COLMEX, Prof. Dr. Silvia Giorguli and Prof. Dr. Gustavo Veja, as well as the head of scientific affairs, Laura Flammand. During the meeting, the success of ‘Between Spaces’ was highlighted and the mutual interest in continuing the productive bilateral collaboration in the social sciences was reinforced. International Research Training Groups, a funding line within the DFG’s Coordinated Programmes, were introduced in 1997. They provide an opportunity for doctoral researchers to train jointly within a group based at a German university and a partner group abroad. The research and study programmes are developed jointly and dual supervision is offered. Doctoral researchers in participating groups are generally expected to spend around six months at the partner institution. The focus is on the qualification of doctoral researchers within a focused research programme and a structured qualification programme, which prepares them for the complex research job market. The programme is open to all subject areas and an interdisciplinary approach is encouraged.